Apple's giving no ground to Spotify. The Windows Store platform’s heating up now that Windows 10 S is here and restricted to Microsoft’s walled garden. At the Windows 10 S launch event last week, it was revealed that Spotify is on its way, and during Thursday’s Build 2017 keynote, Windows chief Terry Myerson announced that iTunes—yes, Apple’s crown jewel—is coming to the Windows Store. Details beyond that are scarce; Myerson simply said that iTunes will include Apple Music and “full support for iPhone,” whatever that means for a Windows Store app. The addition of iTunes and Spotify to the Windows Store will make Windows 10 S’s restrictions a little bit less onerous, and I’m looking forward to the new iTunes app even as a fierce traditional desktop advocate. Why? Because the iTunes desktop app for Windows PCs has been a burning pile of garbage for as long as I can remember. Maybe this Windows Store app can improve the situation for iPhone users and music aficionados. It certainly can’t make it any worse—though it’s likely to be a straight Project Centennial conversion of the desktop app and thus just as atrocious. Beyond the Windows Store implications, it’s interesting to see Apple refuse to give any ground to Spotify as the two streaming music services battle for your attention. 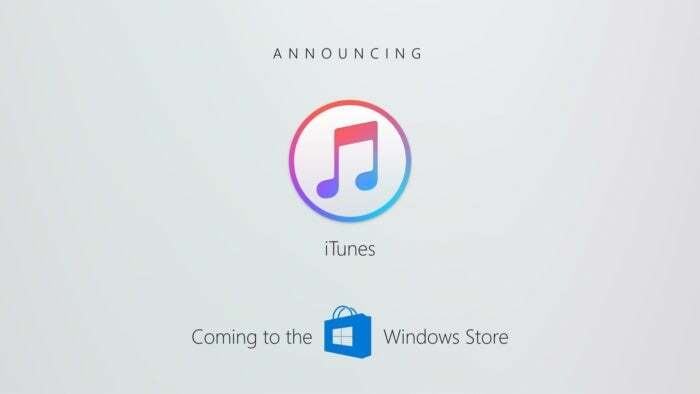 Microsoft did not announce a specific launch date for iTunes in the Windows Store.